After losing one of his two sons to the worst attack against minority Shias in Pakistan’s history, Ali was determined for the other to find a new life abroad. “Go,” he told Iqbal Hussain, who left his job and family behind after losing his brother Mohammad Hassan to join thousands of others on treacherous waters in search of hope. In the Shia-dominated Mari Abad quarter of Quetta, each family has tales of death and exile. Sectarian violence — in particular by hardliners against Shias, who make up roughly 20 per cent of Pakistan’s 200 million people — has claimed thousands of lives in the country over the past decade. In the latest bloodshed, 44 Shias were massacred in Karachi on Wednesday, in the first attack claimed by the Islamic State group in the country. The worst atrocities, however, have struck Balochistan, home to some 200,000 Shias, according to local organisations. The constant fear of violence is pushing young people towards illegal migration. The worst such attack so far, on January 10, 2013, saw a suicide bomber blow himself up in a small snooker hall. About ten minutes later, when rescue workers had rushed to the scene, a truck packed with explosives that had been parked near the hall was detonated. The overall toll was close to 100 dead. Among them was Hassan, who had gone to help. His brother Hussain survived, but with 38 shrapnel wounds which pierced his body. “After six months, his mother was insisting, ‘I have lost my son, I don’t want to lose a second’,” said Ali, standing in the cemetery Hassan was buried in, where a corridor of photographs of martyrs fix their gazes on passersby. Ali, who had saved $20,000, sent Hussain and his mother to Karachi, then legally onward to Indonesia. There, they placed their lives in the hands of people smugglers, and set off on a boat for Australia — the promised land — just before the conservative government there changed the law, and began sending back all new illegal migrants. “The boat was very dangerous, there were 200 people, among them around 20 people from Quetta. It was very tough, the water was rough, we called for help and were finally picked up by a fishing boat,” Hussain said. After the journey to a transit camp, the pair made it to Melbourne and today Hussain is learning English. Like Hussain, another young man Ali Raza also wanted a new life. 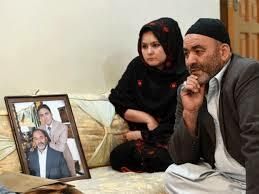 In 2011, Raza, who belongs to the ethnic Hazara community — a predominantly Shia group whose distinct Central Asian features make them easy targets for sectarian militant groups like Lashkar-e-Jhangvi (LeJ) — lost his best friend Yusuf to an attack in Quetta. After the attack, he had only one goal: to leave. His father Syed Qorban, a tyre vendor, helped him move to Malaysia, where he hoped he would set up a business. That plan, however, never materialised. “He called me to tell me he would be leaving for Australia. I told him, ‘Don’t go, my son’,” cried the old man. Their old boat, which carried 250 illegal migrants, sank in the sea. Some decomposed corpses were found, while others, including Raza’s were taken by the sea — something the family is still coming to terms with. “Even today, I am sorry. How did I let this happen,” his father said. Mushtaq, who declined to be identified by his real name, was on the same boat as Raza, but managed to survive three days adrift at sea, without drinking water, being burned mercilessly by the sun. “When we were found at sea, my lips were cracked and my skin was raw,” he recalled. Sent back to Indonesia, he tried to make the illegal crossing again. During one part of the journey, “I lost consciousness, I was having flashbacks for the first time,” he said. “I couldn’t sleep, I was afraid of death at every moment,” said Mushtaq, who finally reached Australia, his Eden, to work on a chicken farm. In Quetta, those Shia Hazaras who remain stick to their own neighbourhoods, without much hope for a future in their homelands of Afghanistan, Iran and Pakistan. And people smugglers — a dirty profession in most of the world — are highly regarded. “Human smugglers for … other people, they might be bad for them. But for us, we give them lot of importance in our society,” said Abdul Khalique Hazara, chief of the nationalist Hazara Democratic Party. “You give me peace, then I would say they must be [stopped],” he added. Wandering between the graves of his two brothers, both of whom were killed for their faith, and his son Hassan, the old man Ali’s heart remains tied to the country that robbed him of his loved ones.